Make the most of your week with our top 14 things to do with kids in Houston from Monday, March 25 to Sunday, March 31, 2019. Make it a week to remember with the kids as you skate around, check out a museum, enjoy plenty of crawfish, see some cultural excitement, and so much more. Cheap Skate Night at Discovery Green | Monday, March 25 – Roll into the week with an inexpensive evening gliding around The Rink at Discovery Green. Skate and save around the rink for just $8 per person on the first night of cheap skating. 5pm to 10pm. Kidtastic at Frolic’s Castle at Memorial City | Wednesday, March 27 | FREE – Sit back and enjoy a cup of coffee while Kidtastic entertains the kids with a puppet show. They will also learn how to create their own puppets and bring them to life. 10am to 11:30am. Nature Story Time at Nature Discovery Center | Wednesday, March 27 | FREE – Get in touch with nature with your little one as you read books on different nature topics and then go on a nature walk or make a craft. Storytime brings nature themes to life for guests. Ages 3 to 5. 4pm. Houston Museum of Natural Science: Discounted Exhibit Hall Admission | Friday, March 29 – See the exhibits you have been wanting to see at a discounted price. Check out McGovern Hall of the Americas, Cullen Hall of Gems and Minerals, Wiess Energy Hall, popular Hall of Paleontology or just visit one. Discounted $11.10 tickets are available for most dates. 9am to 5pm. Bayou City Arts Festival at Memorial Park | Friday, March 29 to Sunday, March 31 – Let the kids explore their creative side at the Bayou City Arts Festival. More than 300 artists will have their works on display, plus live music, a KidZone and more entertainment. Tickets cost $12 online; $15 at the door. 10am to 6pm. Tomball German Heritage Festival in Old Town Tomball | Friday, March 29 to Sunday, March 31 | No Cover – Put on the lederhosen and say Prost at the Tomball German Heritage Festival all weekend. The family-friendly festival will offer a heritage center, four music stages, more than 200 street vendors, a wine and petting zoo, street performers, arts and crafts and more. Times vary. Family Movie Night: Peter Rabbit Movie Screening at Levy Park | Friday, March 29 | FREE – Bring the family to a free screening of Beatrix Potter’s classic tale-turned-animated movie, Peter Rabbit, outside on the lawn at Levy Park. The mischievous rabbit takes you on a whirlwind adventure along with friends. 7:30pm to 9:30pm. Why Don’t We in Concert at Smart Financial Live | Friday, March 29 – Take the tweens and teens to dance the night away to the dreamy Pop group, Why Don’t We when they take the stage at Smart Financial Live. These 5 guys bring their “8 Letters” tour to Houston for one night. Tickets start at $39.50. Show starts at 7:30pm. Bellaire Touch a Truck at Evelyn’s Park | Saturday, March 30 | FREE – Bring the kids for a sensory exploration of monster trucks, heavy equipment, high-water vehicles and more when Texas Children’s Hospital joins Bellaire Police Department for Touch a Truck at Evelyn’s Park. 9am to 1pm. McDonald’s Houston Children’s Festival at Tranquility Park | Saturday, March 30 and Sunday, March 31 – Join families from all over Houston for two days of games, circus acts, rides, food, beverages, and entertainment at the largest children’s festival in the country. There will be 6 stages of entertainment, multiple adventure zones, featured celebrities and more. Tickets start at $12. 10:30am. Annual Houston Crawfish Festival at Discovery Green | Saturday, March 30 – Dig into to fresh mudbugs at Discovery Green. Teach the kids to roll up their sleeves and get to work on the tasty morsels of Southern goodness. The family-friendly festival also features bounce houses, face painting, magicians, and crafts for the kids. Tickets start at $10. 11am to 10pm. 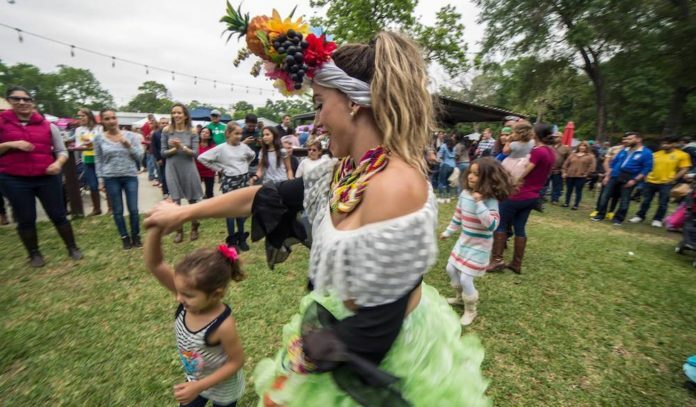 Brazilian Food and Music Festival at Constellation Field Stadium | Saturday, March 30 – Take the family on a fun trip to experience Brazil right here in Houston. You can meet talented chefs and musicians and introduce kids to fun activities. Tickets are $15; $91 for VIP access, but limited comped (you only pay the ticketing fee) and discounted $40 VIP tickets are available. Noon. Monster Energy AMA Supercross at NRG Stadium | Saturday, March 30 – The ear busting, mud-slinging dirtbikes of AMA Supercross come to NRG Stadium for a FIM World Championship event. Watch as they soar into the sky and land low in the dirt. Tickets start at $30. 6:30pm. Katy Crawfish Festival at No Label Brewing Co. | Saturday, March 30 and Sunday, March 31 | No Cover – The whole family will enjoy spending the afternoon at No Label Brewing Co. for freshly cooked crawfish, live music, and fun for the kids. Bring some chairs and sit back while the kids play on the playground and enjoy the other activities. Noon to 6pm. 17th Annual Run for the Rose at NRG Park | Sunday, March 31 – The Dr. Marnie Rose Foundation invites you to join them in raising funds and awareness for brain cancer during their 17th Annual Run for the Rose at NRG Park. Compete in the 5k race as a timed competitor or take it slow with the non-timed 5k or Family 1k. Early bird tickets start at $20 for timed 5k for ages 3 to 12; $15 for non-timed 5k. $35 for timed 5k for ages 13 and older and $30 for non-timed 5k. 8am. Shea Kummer is a mom to 3 active boys living in Katy. She has a business degree from Texas Christian University and a background in social media management. When she's not cheering on her boys, she can be found looking for the best ways to make lasting family memories.